Combining scientific research with years of experience consulting Fortune 500 companies, to help you improve the quality of your life. From teaching you to become more productive to guiding you to improve your relationships, this program will help you live every day with incredible energy and vitality. Humor, relaxation, proper nutrition, adequate exercise, and positive thinking lead to high energy levels that make up the foundation of happy and successful lives. 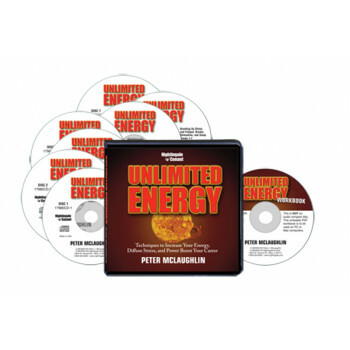 Energize Your Life for Unlimited Success! Humor, relaxation, proper nutrition, adequate exercise, and positive thinking are what lead to high energy levels that make up the foundation of a happy and successful life. This life-altering program not only will help you adopt a positive, productive mindset, but, with a strategic diet and exercise program, will train and fuel your body to deliver optimal results. Armed with the tools you’ll find in Unlimited Energy, you will emerge refreshed and active after a long day’s work, enjoy performing common tasks you may have previously dreaded, and find a renewed pleasure in every activity. With an abundance of energy, stamina, and vigor, you will perform at your highest level.